Morning: (minimum 2): Tours start between 8:30 a.m. and 9:00 a.m. depending on where you are staying. Afternoon: (minimum 4): Tours start between 1:30 p.m. and 2:00 p.m. depending on where you are staying. We pick up and drop off at all hotels and pensions. What You Will Visit: Archaeological Sites of Maeva Village and Mata’ire’a Hill. Fare Pote’e Museum (includes admission fee), Fish Traps, Vanilla Plantation, beach on Motu Maeva, Giant Blue Eyed Eels in Faie Village, Belvedere View Point and the modern day capital village of Fare. What You Will See: Archaeological Sites, Fare Pote’e, Fish Traps, Plantations, Eels, Mountains, Vistas, Villages, Valleys, View Points, Beaches, Bays, Motus, Flora and Fauna. 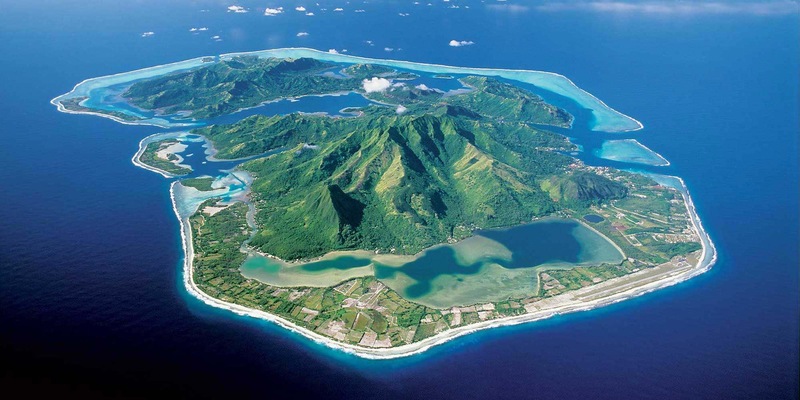 What You Will Learn: Polynesian Origins and Migrations, Traditional Polynesian Religion and Culture, Marae (temples) and Archaeological Sites, Explorers and Missionaries, Island Formation, Life Today in the Islands. What You Can Purchase: Don’t forget to bring some local currency, as you may wish to purchase some vanilla or vanilla products at the Plantation. Some local handicrafts are also available in the Fare Pote’e Museum. Tours start between 8:30 a.m. and 9:00 a.m. depending on where you are staying. What You Will Visit: Archaeological Sites of Maeva Village and Mata’ire’a Hill. 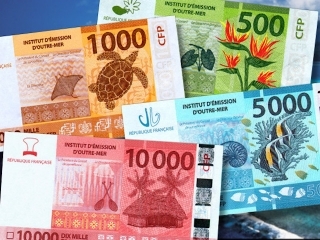 Fare Pote’e Museum (includes admission fee), Fish Traps, Vanilla Plantation, beach on Motu Maeva, Giant Blue Eyed Eels in Faie Village, Belvedere View Point, Le Mahana Hotel, Avea Beach, Marae Anini and the Tefareri’I View Point. What You Will See: Archaeological Sites, Fare Pote’e, Fish Traps, Plantations, Eels, Mountains, Vistas, 8 Villages, Valleys, View Points, Beaches, Bays, Motus, Flora and Fauna. 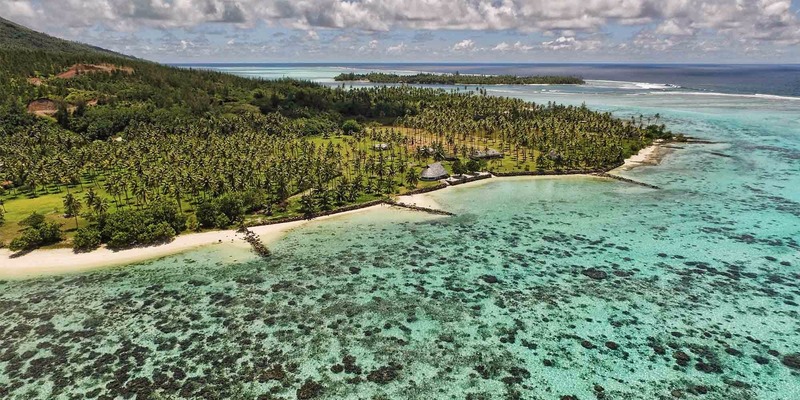 The Day Tour includes a stop at Mahana Hotel, where you may have lunch and afterwards can relax and enjoy the magnificent beach, go for a stroll, swim or snorkel. Don’t forget to bring towels, sunscreen, swimwear and snorkeling equipment. Get your very own guide and the tour will adapt to your demand. 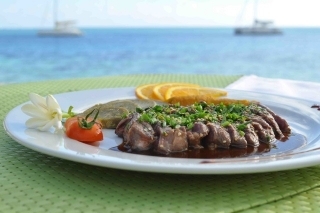 This choice can give you the ultimate experience on the island. You will be able to visit the way you dreamed about...Contact us directly to customise your private tour. 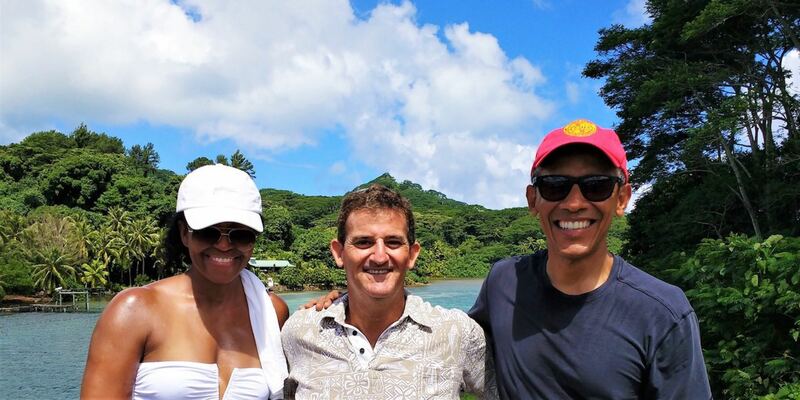 Please book through Paul Gauguin Cruises Website by clicking here. Explore the life, culture, and traditions of Tahiti past and present during this tour of Huahine’s most sacred villages and sites. 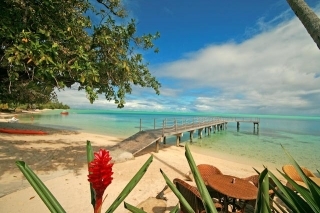 Depart the pier via off-road vehicle for an intimate guided discovery tour of Huahine. The island is renowned for its Royal Village of Maeva, considered to be one of French Polynesia’s most important archaeological areas. During your walk through the village, you will explore the archaeological sites along the lake-shore and the Fare Pote’e Cultural Center. Continue on to Mata’ire’a Hill. 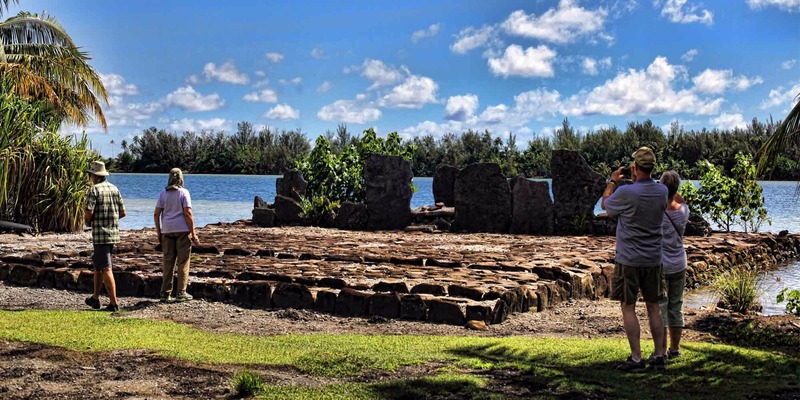 Located just above the village of Maeva, Mata’ire’a Hill is home to more than 200 stone structures, including marae (ancient Polynesian temples), agricultural terraces, house foundations, fortification walls, and burial platforms. You’ll next stop at Faie Village, where you will have an opportunity to feed the famous giant blue-eyed eels that populate a stream running through the village. From here, you will ascend the mountain to Belvedere Point for panoramic views and photo opportunities over Maroe Bay and Huahine Iti. 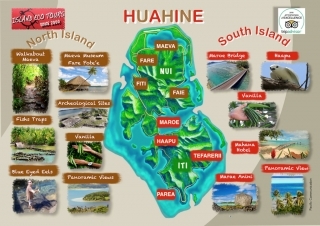 Your tour concludes with a stop in Fare, Huahine’s main village. Accompanied by your guide, you will take a firsthand look at modern-day life on the island, as well as a historical glimpse at its storied past. Following your tour, you will reboard your off-road vehicle for the return ride to the pier. Please note: This tour involves some slight uphill walking. Guests are encouraged to wear comfortable walking shoes, sunscreen, a hat, and sunglasses. The order of sites visited may vary. Please bring some cash along with you, as you may have the opportunity to purchase some authentic Tahitian vanilla during this tour. 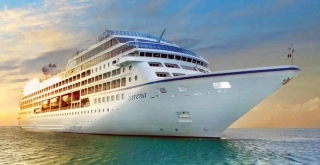 Please book through Oceania Cruises Website by clicking here. 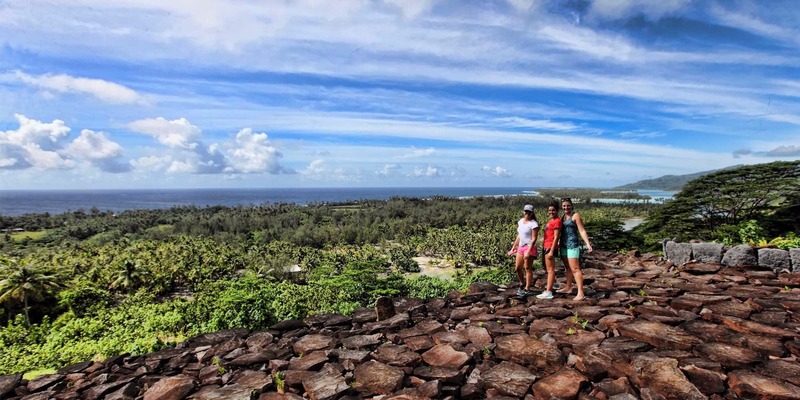 Experience Huahine's history, traditions and archaeological sites on this in-depth "walk-about" tour. 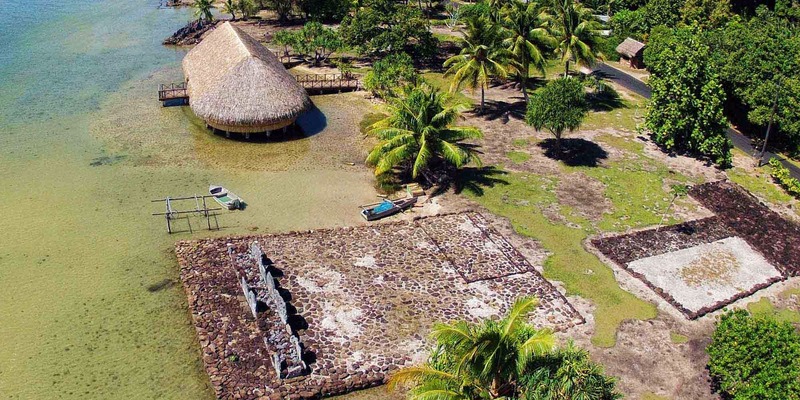 You will leave the pier aboard the open-air "Le Truck" and make your way to Maeva Village, home to the densest concentration of archaeological sites in Polynesia. At one time, this was the traditional home to all of the island's chiefs and their families. Marae, or prehistoric temples abound here and stand as a testimony to the uniqueness and importance of the area.Just above the coastal flat of Maeva is Mata’irea Hill, home to over 200 stone structures, including marae, agricultural terraces, house foundations, fortification walls and burial platforms. Your guided walk of the area gives you a first-hand look at these sites and will allow you to see into the past. During your visit, your guide will cover various diverse subjects; including Polynesian origins and migrations, traditional Polynesian society, plants and animals, religion and warfare, the arrival of European explorers, missionaries, soldiers and whalers. Re-boarding "Le Truck", you will next see the stone fish traps of Maeva’s Lake Fauna Nui, which are still in use by the villagers after many hundreds of years. Your return route to the pier will take you through the village of Faie for a visit with the giant blue-eyed eels, and then up the mountain to the Belvedere Lookout where you will have a wonderful photo opportunity of the beautiful Bay of Maroe. Please note: There is walking on this tour that includes some walking both uphill and downhill and uneven and natural surfaces. Le Truck is a casual, open-air vehicle resembling a windowless bus. Due to road conditions in some areas of the island, you should be prepared for a bumpy ride during parts of the tour. The tour is not available to wheelchair guests or those with mobility concerns. Lightweight clothing; sun caps; sunglasses; sunscreen; insectant repellent; a bottle of water from the ship; and flat, comfortable walking shoes are recommended. The itinerary and order of the stops may change and the duration of the stops can vary based upon group size and interest. 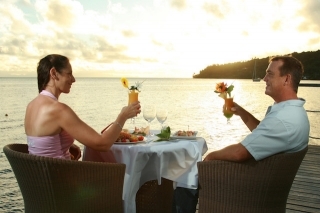 Please book through Windstar Cruises Website by clicking here. 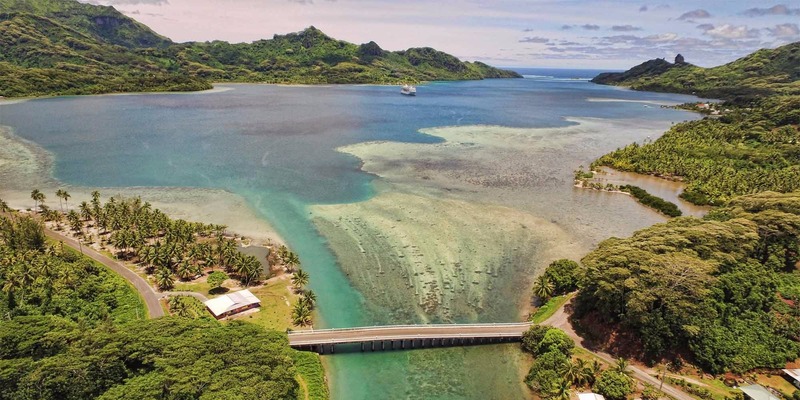 You will leave the pier aboard an open-air vehicle and make your way to Maeva Village, home to the densest concentration of archaeological sites in Polynesia. Marae, or prehistoric temples, abound here and stand as a testimony to the uniqueness and importance of the area. Just above Maeva is Mata’irea Hill, home to over 200 stone structures, including marae, agricultural terraces, house foundations, fortification walls, and burial platforms. Your guided walk of the area gives you a first-hand look at these sites. See the stone fish traps of Maeva’s Lake Fauna Nui, which are still in use by the villagers after many hundreds of years. Your return route to the pier will take you through the village of Faie for a visit with the giant blue-eyed eels and then up the mountain to the Belvedere Lookout where you will have a wonderful photo opportunity of the beautiful Bay of Maroe.